Why I choose Enova - Enova International, Inc.
Three and a half years ago I made one of the biggest decisions in my life. I chose to leave my HR position at a Fortune 100 retailer — a company which had employed me for over a decade — to search for a new challenge. I was hired as an HR Generalist at Enova and know now this was the best decision I could have made. Enova stood out to me back in 2013 because this is a company that focuses on their culture and making the employee experience better. Almost four years later, I am excited to have so many reasons why I stay at Enova. Many companies will point to their employee opinion survey to demonstrate their commitment to employee engagement. We, like many others, have a survey in the fall and a pulse check every spring. The things that sets Enova apart is the dedication of the company to enact real changes based on this feedback. People and Talent are here to help provide guidance and support, but our managers really drive the action steps for their teams. This people-first approach continues to deliver a positive measurable impact with our engagement scores steadily climbing over the last 2 years and sitting at 69% now — much higher than the national average of about 30%. Open seating, team rooms, and white board walls are only part of what makes Enova a place that thrives on collaboration. After the physical items are stripped away, it is the focus on inter department collaboration that truly makes the difference. Employees know that we won’t achieve our goals as an organization if we work siloed within our teams. We have the ability to be bold and most fast through utilizing the right people at the right time and not having one team or department take on all the work. Best answer wins. This is one of Enova’s values and you can see this being lived out each day. We strive to ensure that each employee knows the importance of their ideas. Whether we’re discussing a new product, improving customer service or improving our benefits, Enova is able to make the best business decision for our customers by utilizing the talents of our employees. This directly drives the culture to be as amazing as it is. Getting to know your voice had an impact and improved your company in one way or another is something you don’t see everywhere. Stocked break rooms, gym discounts, summer hours and on-site perks (manicures, haircuts, massages) are just a few things all corporate employees at Enova get to experience. Beyond those we offer some really cool perks when you reach different milestones. Two of my favorite are our sabbatical and new parents program. Yes, you are entitled to a month long sabbatical after your 4th, 9th and 14th anniversary! Take a trip of a lifetime, get married, spend the summer with your kids! We get to hear and see all different reasons employees use their sabbaticals. This year we launched our new parents program which not only revamped our parental leave (6 weeks for primary, 3 weeks for non-primary) but also added some nice new benefits for parents when they return to work; flex time for your first few weeks back in the office, $500 in baby cash, and ways to connect with other new parents at Enova. Career growth is something most employees want. 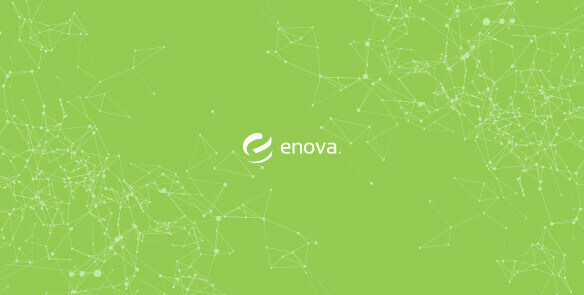 At Enova we make sure we have opportunities available within departments and across the company. Too often career growth is viewed as a promotion but it is so much more than that. Getting the opportunity to lead a company-wide project, working on a new product line or being able to spend time learning a new skill set are just a few things that are offered at Enova. Our tech exchange, analytics rotational program and the job shadow program are a few examples of how we formally encourage employees to grow their skills. Allowing associates to take time out of their normal tasks to gain a new skill has helped Enova identify opportunities for permanent moves for employees if they want to take their career in a new direction. Top Talent & Teamwork. This is another one of Enova’s values and probably the one that is closest to my heart. The focus around our organization’s talent doesn’t just happen at time of hire and during the year-end review process but it is something we live and breathe every day. Managers and above can speak to the performance of their teams, their employees’ achievements and goals, and how that impacts the overall organization. A lot of our success can be attributed to the quality of employees we hire and how those top talent individuals truly motivate their peers above and beyond what you see at other organizations.